Published Nov 30, 2012 by Addison-Wesley Professional. Part of the LiveLessons series. Implementing Agile is a huge organizational change, and it's difficult. Today's organizations are complex adaptive systems that will react in unpredictable ways when change is introduced. Some consider Agile processes and tools while others treat Agile as a mindset. Organizations are far too complex to assume one path to agility is the right path for everyone. Jason Little has been in the software industry since 1996 and has been helping organizations adopt Agile practices since 2007 as a Scrum Master, Product Owner and Coach. In this video Jason will show you a four step model that will help you shape your path to business agility. In addition, this video talks about how to leverage the Lean Startup method even if your organization is not a startup. The Roots of Agile provides a quick history of Agile. Viewers learn about the disconnect between approaching Agile as a mindset versus approaching Agile as a set of tools and practices. 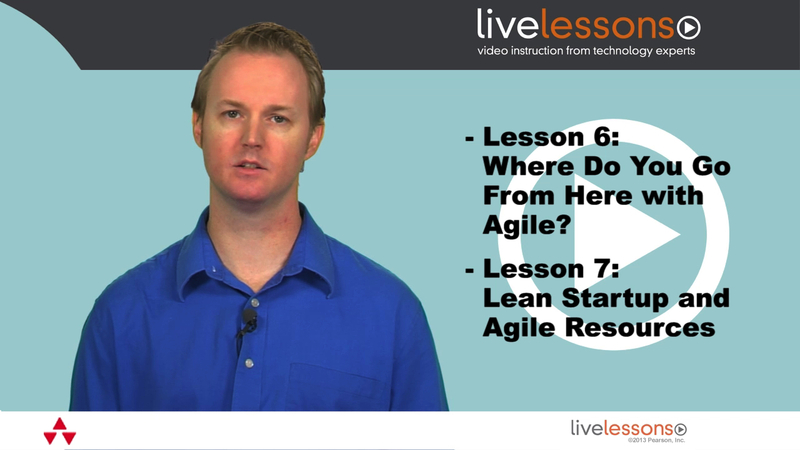 Next, the video covers Business Agility and introduces the differences between Agile Adoption and Agile Transformation. Understand covers the first step in Jason Little’s 4-step model. It's not only important to understand the business objective for bringing Agile into an organization but also the organization's culture and the people who work inside that culture. These elements are critical to understanding how to shape the path to agility. Educate is the second step in the model and covers the options for learning about Agile and, more importantly, organizational change. Viewers will learn about certification options and alternatives to certification Next, the video covers getting educated on system thinking and organizational change as well as how to create a buzz inside the organization by leveraging people and resources within the local community. Execute is the third step, and it deals with options for bringing agile into an organization. The video covers establishing a pilot program, big bang, and evolutionary change to help viewers decide which approach is best for their organization. Regardless of the approach chosen, viewers will learn about the importance of making the change visible within the organization and how to use metrics. Reflect is the last step in the four step model, and it involves retrospectives. Retrospectives are perhaps the most important aspect of any organizational change. It’s an agile practice, but even if a company isn’t agile, it can leverage the power of reflecting on progress. Viewers will learn how to combine retrospectives with dynamic governance, metrics and intangible metrics to drive organizational change. Where Do You Go from Here with Agile? summarizes the model and encourages viewers to pick the parts of the model that make sense for them and their organization. The video reinforces to viewers the importance of staying focused on the business’s purpose and that the model does not need to be linear. This lesson steps viewers through a model with an example and provides users with a one page change plan. Lean Startup and Visualization Techniques covers how the methods can be used at the enterprise level and not just with start-ups. From there, the video covers visualization techniques and examples used by organizations.